You can also select the financial year that you want the draft to move to for example, a 2017/18 draft can be promoted to the 2018/19 working plan. Hover your mouse over the draft plan that you want to promote to Working. Click on the three vertical dots, select Set as Working Plan. What happens to the existing working plan? You can only have one working plan at one time. The plan that was previously used within the working plan moves down to the Drafts section and becomes a draft plan. TIP: If a draft wasn't used when the working plan was first created i.e. 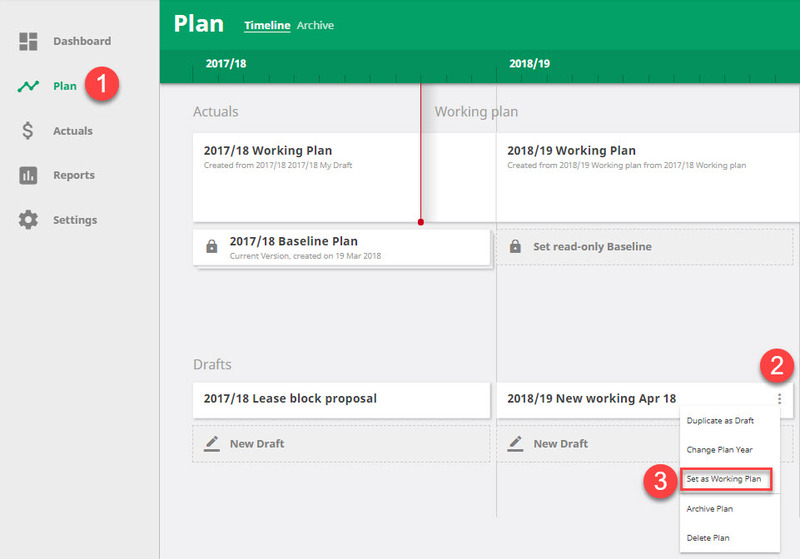 you created your working plan from scratch, it will be called 'Year' Working plan when it moves to the Drafts section. How can you tell what plan is used with the working plan? At any time, you can see what draft, if any, makes up the planned transactions in the working plan. For example, the 2018/19 working plan (below) now includes planned transactions from the draft plan 'New working Apr 18'.